Milton Road in North Cambridge, where £23m of City Deal money has been allocated. A huge amount of power is concentrated in the three councillors who are voting members of the Greater Cambridge City Deal board. The three councillors have all the powers of the Cambridge City, Cambridgeshire County County, and South Cambridgeshire District Councils delegated to them to use for the purposes of the City Deal projects. The councils in the Greater Cambridge City Deal area have agreed to delegate powers to the board to the extent the board requires them to pursue its objectives. Cambridgeshire County Council are currently in the process of clarifying which powers it considers have been delegated to the board. Does the board expect similar clarity over which powers Cambridge City Council and South Cambridgeshire District Council consider to have delegated? I suggest the board itsself makes clear which powers it considers it holds, and which powers it intends to exercise in relation to particular schemes and circumstances. This is important so that those interested can understand and follow the decision making process and focus campaigning and lobbying appropriately. I’m interested in if the board consider powers relating to decisions on tree works, including felling, have been delegated to it. Specifically, for example, I’d like to know if the board will be consulting and taking decisions on tree works and felling relating to the Milton Road proposals or if decisions relating to the trees will be made following the current practices involving the local councils. 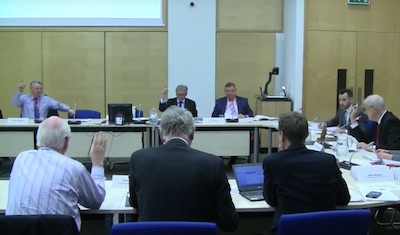 The three Councils agree to delegate exercise of their functions to the Executive Board to the extent necessary to enable the Board to pursue and achieve the objectives of the Greater Cambridge City Deal and to undertake any actions necessary, incidental or ancillary to achieving those objectives, and, accordingly, the three Councils shall make the necessary changes to their respective schemes of delegation. The Executive Board may further delegate to officers of the three Councils. Has been and remains designated by the Greater Cambridge City Deal Executive Board as a City Deal infrastructure scheme. Is, or has been funded in whole or in part by funds received by the County Council under the auspices of the Greater Cambridge City Deal or allocated to the Greater Cambridge City Deal Executive Board by participating Authorities. I would rather have one council for Greater Cambridge, giving us democracy in depth, rather than concentrating all local government powers in three individuals. This entry was posted on March 2, 2016 by Richard Taylor. I’m Richard Taylor, I’m a resident of Cambridge. Two disclosures: I own a house on Milton Road and I used to work with Nigel Slater [The Cambridge University representative on the board]. The three of you, the three councillors on the Greater Cambridge City Deal board, can if you wish, wield all the powers of the area’s local councils. The councils have delegated their powers to you for the purpose of pursuing the City Deal’s aims. I want to urge clarity over which powers you intend to actually use in respect of each of the City Deal’s projects. This is important for transparency and accountability and so people know where to target lobbying. As a specific example I don’t know if the three councillors on the board here will decide the fate of Milton Road’s trees or if the decision making will go through the city and county council’s existing processes for consulting, and taking decisions on, highways tree works proposals in the city. Sorry Richard, it is about more than just trees – it is about junctions, blocking off roads, ‘No Right Turns’, bus lanes, everything even partially funded by City Deal. At the moment if a change to the highway is proposed, we can make representations to our County Councillor, who generally knows the area well, and who can be ejected at the next election. These ‘clarifications’ will have to go to a full meeting of the County Council for approval. If the select group on the Highways Committee don’t understand what is being given away then the full Council will not have a hope. If they (full Council) approve the latest set of changes, the power could / will probably be delegated to the officers. The only course of action will then will be to compress all our objections into a single one-minute question to City Deal Exec – not easy if the whole of Milton Road is dealt with in one Traffic Order. Time to make our feelings know to the full Council, I suggest. I’ve never suggested this is only about trees. Sorry – wrong date. HCIC meeting was on 1 March. I attended the Greater Cambridge City Deal Board meeting on the 3rd of March 2016 to put my question. I obtained an assurance that the board would publish details of which powers it intended to exercise in relation to each project. Officers said the position in respect of taking decisions on the trees was complicated and they couldn’t say at the meeting who would take the decision. Greater Cambridge City Deal Board Chair Cllr Herbert: Question eight is from Richard Taylor and that relates to the delegations and related issues. Welcome. Richard Taylor: I’m Richard Taylor, I’m a resident of Cambridge. Two disclosures: I own a house on Milton Road and I used to work with Nigel Slater, one of the board members. Now the three of you, the three councillors members of the board here can potentially exercise all the powers of the our local councils in this area. What I’ve come today to do is to urge you to be very clear about which of those powers you are intending to exercise in relation to each scheme. I think that’s really important for transparent decision making and so people know who to lobby. As a specific example, on Milton Road, I don’t know at the moment who will take decisions relating to tree felling and tree works. I don’t know if that’s going to go through the existing city and county council process or if that’s a power you’re going to take here, and if the three councillors here will take the decisions on the Milton Road trees. Greater Cambridge City Deal Board Chair Cllr Herbert: You’ve raised very important questions and we need to be precise in responding to them. I think Tanya is going to respond but I think what we propose to do is to put in writing what the protocol is both in terms of what this City Deal board will take decisions on and what we will leave to other authorities to be clear as to which is which. Do you want to add Tanya? Tanya Sheridan, Greater Cambridge City Deal Programme Manager:Graham is. Graham Hughes – Executive Director Economy, Transport and Environment, Cambridgeshire County Council: Thank you chairman. I just specifically so as the chair said we can summarise I think that’s the easiest way and we can make it available and put it on various websites and give some clarity. If I just touch on Mr Taylor’s point specifically about the trees. That is actually a really really complicated issue. We only had 24 hours notice of the question so we have been trying to make it absolutely clear as there is a relationship between the primacy of the different if you like parts of the legislation, it’s the Highways Act and the Planning Act so with the 24 hours we’ve had it has not been possible to put together an absolutely definitive answer on the tree issue but we will do that and certainly as the chairman has said with the powers that have been delegated to this board we can clarify that position as soon as we can. Greater Cambridge City Deal Board Chair Cllr Herbert: So we register it is a really important question and we do need to have some clarity. We haven’t taken on powers from the County Council to abuse them we’ve taken them on to be clear there’s an integrated decision process. Greater Cambridge City Deal Board Chair Cllr Herbert: Thank you very much. I used a public question at Cambridge City Council’s Full Council on the 22nd of October 2015 seeking clarity on responsibility for taking decisions on tree works and tree felling. The Greater Cambridge City Deal Board Terms of Reference as agreed by the councils in the area state only the three councillors on the board have a vote and the Cambridge University and Local Enterprise Partnership members are non-voting members. I’m not sure how we’ll proceed on this one. It will probably be putting the alternate recommendations basically before us and see which one is supported. Perhaps professor Slater is going to have the casting vote. The Cambridge University rep did take part in the vote; but the three councillor members were in agreement in any case. The board’s terms of reference require it to operate on the basis of consensus. It’s pretty clear that this statement relates to the voting of the three councillor members, but it could perhaps be interpreted to extend to seeking the consent of the University and Local Enterprise Partnership. The University’s “vote” could be seen as giving consent. Ultimately the decision making powers of the board are exercised via a vote of the majority of three councillor members. I think there is a need for clarity; perhaps this is something councillors at each council which has delegated its powers to the board will review. 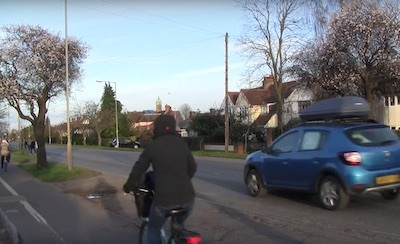 Within the boundaries of the public highways, trees fall under the remit of the transport authority (meaning Cambridgeshire County Council in the local case). Decisions regarding trees on the public highway are delegated by the County Council’s Planning Committee to that organisation’s Executive Director – Economy, Transport and Environment. It will therefore be that officer who is responsible for making decisions regarding trees on the public highway. According to The County Council’s website the officer with holding the powers is Graham Hughes. Mr Hughes is the officer who answered my question at the Greater Cambridge City Deal meeting and didn’t at that point know where the powers lay! I think it is appalling that councillors have delegated such important decisions about the city’s environment to an officer. I spoke at the City Deal board on this point on the 1st of September. The officer responding, and the board chair, indicated the published document is inaccurate. I suggested it be corrected. I raised my concerns about such a key contentious decision being delegated to an officer at the North Area Committee on the 31st of March 2016. This prompted a rather incomprehensible argument between a Liberal Democrat and Labour councillor and a number of statements irrelevant to the point I had made. Cllr Scutt gave a reply but it had no connection to my question. I used another public question to re-state my original question. Cllr Scutt promised to take the question to the City Deal Assembly and Board (as I have already done). I understand as part of the city deal, pro-EU Cambridge will be allowed to cooperate with the EU. There is a rumour going round on Twitter which was perpetuated by a certain Mr Taylor that the the Greater Cambridge City Deal has said that the decisions on the Milton Road trees, whatever they are, will be taken by officers, I don’t believe that is the case, I believe it will be taken effectively when the overall scheme comes back to the executive board to be voted on, could we please get clarification on that please? Cllr Manning later persisted misrepresnting my actions when all I have done is quoted from referenced Greater Cambridge City Deal Document. @RTaylorUK @MiltonRoadRA @CambsCC you need to apologise to me Richard, not the other way around. Tbh though, in not that bothered. I reiterate that all I have done here is publish a quote from the Greater Cambridge City Deal “Summary of infrastructure decision making” document, while with providing a link to that document on the City Deal website. Decisions regarding trees on the public highway are delegated by the County Council’s Planning Committee to that organisation’s Executive Director – Economy, Transport and Environment. It will therefore be that officer who is responsible for making decisions regarding trees on the public highway. As Cllr Manning has not taken the opportunity offered to him to apologise I thought it was right to make that statement to allow Mr Taylor, who like all of those we represent, is not in a position to raise a point of personal clarification when he is misrepresented and impugned in this chamber to provide this point of clarification. I would hope that Cllr Manning would apologise in a manner which will reach others who will have heard or read his remarks, both in the council chamber and subsequently.